Prime Minister Lee Nak-yon was to leave Thursday for a weeklong trip to Kenya, Tanzania and Oman to bolster economic cooperation and business opportunities with the countries. 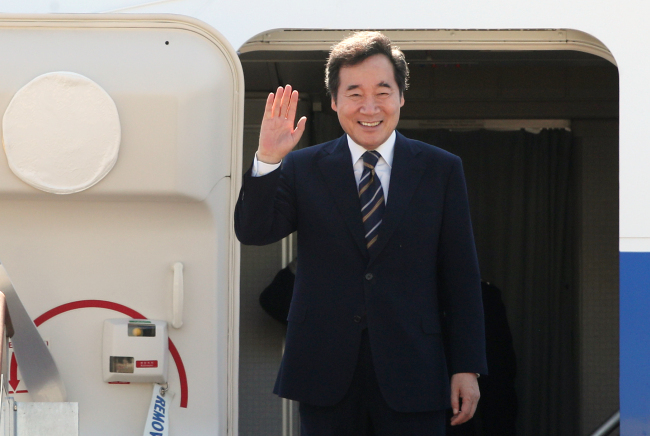 Lee will travel with 74 businessmen from 49 companies on South Korea's presidential jet. It would be the first time that the prime minister has used Air Force One on a long distance trip. President Moon Jae-in suggested Lee use the plane, officials said. Lee will first stop in Kenya for a three-day visit that includes talks with President Uhuru Kenyatta about increasing trade and investment between the two countries, such as ways for South Korean companies to expand to the African nation in infrastructure, energy and other areas. Lee also plans to attend a Korea-Kenya business forum; visit the Kenya office of the Korea Program on International Agriculture, an assistance project run by the state-run Rural Development Administration; and attend a ceremony to deliver World Food Programme aid to the country. Lee will then head to Tanzania for a three-day visit that will make him the first leader-level South Korean official to visit the African nation since the two countries forged diplomatic relations in 1992. The trip includes a courtesy call on President John Magufuli, talks with Prime Minister Kassim Majaliwa, a visit to the site of South Korea's official development assistance program in the country and a forum of business leaders of the two countries. The talks with Majaliwa will focus on how to carry out ODA projects successfully and expand South Korean companies' presence in the African nation. The two sides also plan to sign a visa-waiver treaty for official and diplomatic passport holders, officials said.